Finding fresh motivation and inspiration can be hard sometimes. I mean, all those online quotes and memes are good to a level, but then what? From time-to-time we all need a change of scenery and the opportunity to engage with new people, face-to-face, who can provide a different perspective to that of our own. As mentioned in previous blogs, one way I like to provide myself with a bit of a boost and some fresh energy is to get out of the office to attend different talks or events in our city. Having the opportunity to meet people who’s path may otherwise not cross with my own is exciting! Although it can sometimes be a challenge to make time in a busy schedule, giving ourselves the opportunity to connect with others and potentially gain valuable motivation and inspiration is ALWAYS worth it. 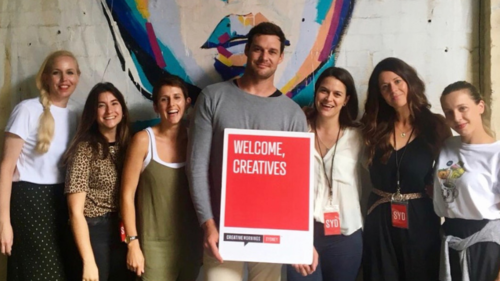 Last week I attended Creative Mornings in Sydney for a dose of inspiration and motivation. For those of you that haven’t heard of Creative Mornings, it’s a monthly breakfast lecture series operating in over 200 cities worldwide. It’s free to attend and you can expect to enjoy fresh coffee and delicious breakfast foods whilst listening to a talk on a global theme. This months theme is ‘Water’. Whilst I was really interested to hear from Marine Scientist and Underwater Photographer Lucas Handley thanks to personal interests, I didn’t consider how relevant his talk would be to us office-dwellers. So, as you can imagine, I was really pleased to walk away from the event with some unexpected practical tips on dealing with stress and anxiety in the workplace. Along with explanations about projects he’s worked on, stunning imagery and thought-thought-provoking videography, Lucas’s presentation focused on the challenge of retraining our minds and bodies to anticipate and relax through periods of stress. As a free-diver, this is critical to his work; panicking just isn’t an option when you’re over 20 meters underwater! However, his approach can also be taken to other uncomfortable situations we all find ourselves in. If we re-contextualise fear, break down impulse and plan for anxiety in our everyday stressful lives, Lucas believes we can learn to relax and appreciate the environment we find ourselves in, resulting in us feeling more positive about our experiences. The difference is how we approach and react to situations. We need to understand discomfort and learn how to move through it. Using audience participation and an example of holding our breath - something Lucas is very familiar with - we dissected the reasons for deciding to breathe in when physically we are able to hold our breath for much longer. Initially, it seems we were focusing on the negativity of the situation; the discomfort, the willingness to fight this discomfort and the impulsive reactions it provokes. We let fear and anxiety come over us as we reacted emotionally. This is because the more we don’t like something, the more we focus on it. Then creating even more stress, tension and anxiety in turn. So, the alternative? Recognise the discomfort and contextualise the anxiety we feel. This is done by using logical thought. By breaking down the information you have available and choosing to be in the situation we can start to relax, own the situation and move through the discomfort. With the example of holding our breath, Lucas fitted a volunteer with a device to measure oxygen levels in her blood. This only dropped from 99-97%, providing the knowledge that she didn’t physically need to take a fresh breath in. She was also provided with a positive distraction to the discomfort in holding her breath by walking through the room and drawing an image for us all to see. This shifted her attention away from the negatives of the situation. By recognising it, contextualising it, understanding and embracing it, we can move through our fear and own a situation. If you’re keen to know more, visit the Creative Mornings website. Also keep an eye out for the video of Lucas’s talk, which will be up soon!